From Sunday 30th September 2018 to Sunday 19th March 2019. 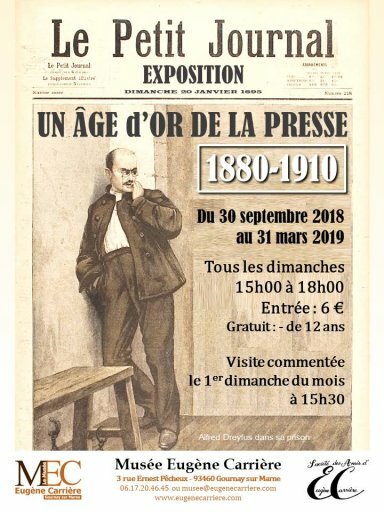 The Eugène Carrière museum showcases the exhibition A golden age of the press 1880-1910. In France, in 1881, a law was adopted to protect freedom of the press. This law opened exciting times that may be termed a golden age of the press. Circulation figures of the newspaper reached record levels and newspaper cartoonists, caricaturists and poster artists had the opportunity to display their talents. The exhibition includes posters, illustrated front-pages, and press illustrations from major daily newspapers, women’s magazines, sport press or satirical newspapers. Works by numerous artists are on display : Belloguet, Eugène Carrière, Jules Chéret, Honoré Daumier, Aristide Delannoy, Clémentine-Hélène Dufau, Jean-Louis Forain, Faustin, Jules Grandjouan, Granville, Hadol, Ibels, Jossot, Frantisek Kupka, Charles Léandre, Alfred Le Petit, Jan Metteix, Eugène Ogé, Pilotell, Albert Robida, Roubille, Steinlen, Félix Vallotton. These works have been borrowed from French museums including the Clemenceau Museum as well as private collectors. The exhibition is open every Sunday from 3 PM to 7 PM. Commented visit on the first Sunday of each month at 3:30 PM. You can ask for a visit in english. Look at more english visits about art and creation. Rate 6 € - Free entrance under 12. Motorway : A4, sortie Champs-sur-Marne.